We @www.indianhiddengems.com, have showcased many masters who guide retailers in selecting their picks, advice the whole idea of value investing and identify hidden gems early. But when it comes to retail and small scale Indian investors, we cannot imagine a name other than this unknown person from Kottayam, Kerala who has been guiding his followers for the last 5 long years. 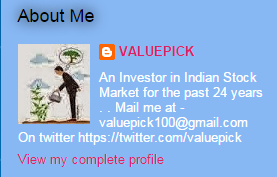 Value Pick alias VP started his blog (http://value-picks.blogspot.com) on Feb 2010 with a humble beginning. To be precise, his first recommendation as a multibagger (Interlink Petroleum) is still trading at one third of his recommended price even after long five years. We feel that he has started the value pick blog as a mere time pass and during the initial days he was not that serious in analyzing the fundamentals an future prospectors of the company's he was recommending. But as the readers circle increased, he raised up to the expectations and came up with unbelievably successful recommendations, better than any other certified, professional research analyst and fund managers across the whole India!! 2013 and 2014 were magic years for VP. He recommended almost all Indian gem stocks which were beaten up or hidden from the retailers. He gave more importance to fundamentals and earning figures than technicals. He even started visiting companies before recommending stocks. People who followed him minted money along with him, realized the fact that India is in a bull market and bagged many unknown nourishing buds. His followers were anxiously waiting during weekends, skipping movies and parties, to read an study the recommendations made in value pick blog. They aggressively waited on the browsers on Monday mornings to grab a little of it and be part of success story. People started admiring him, loving him and treating him as a family member. VP patiently answered all the queries and guided all his followers to overcome the roller-coaster ride on Indian market. Many times the companies he recommended had to clarify BSE and NSE that there was nothing unusual from their side on the unexpected price rise. There were occasion where his recommended stocks traded in upper circuit for continuous 2 weeks. Out of his 295 recommendations till December 2014, 78 stocks went down with Ramkey Infra giving maximum loss(Recommended Price: Rs. 280, Current Price: Rs.33). 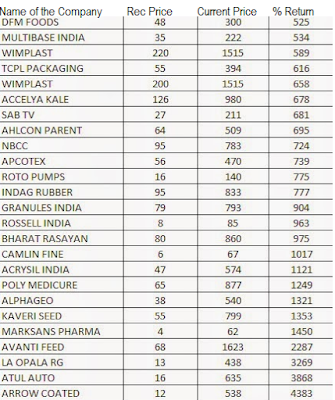 215 stocks went up with Arrow Coated Product giving maximum returns (Recommended Price: Rs. 12, Current Price: Rs.515). He has identified and gave confidence to small investors to invest in many stocks like Granules India, Wimplast, Athul Auto etc. Here all the best picks of Value Pick Blog. 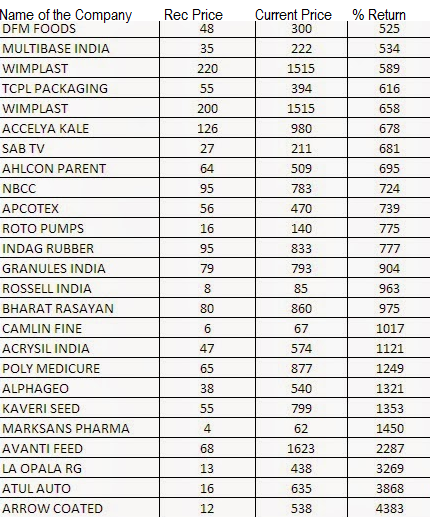 A 1 lakh invested in Arrow Coated 2 years back is a whooping 43 lakhs now!!! Its amazing wealth, Isn't it Guys? That is the reason why this anonymous stock market veteran has fans and followers across all over the world. "Dear VP, You have been a awesome mentor, real motivator and teacher who taught us the power of value investing than anyone else. Hats Off to you and on behalf of all our readers, take our bow!!!" Give a link to his blog..
Don't you think Arrow Coated is highly priced for a 17 Cr Sales? Sir you are giving recommendations on this blog then why not VP sir on his blog? Hats off to your Spirit , and i bow you and Greatness for praising VP Sir. By doing this you have more Credit to yourself . I foloow VP sir and now will also follow you too.